Ohh it’s that time of year… festival season is fast approaching! 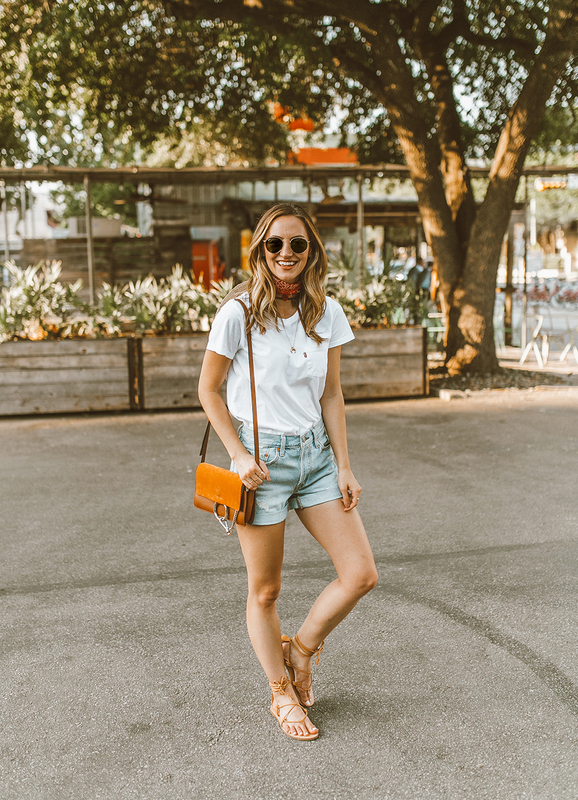 With Austin City Limits just months away, it’s time to start planning my outfits… and the best part about this particular look? You can wear it aaaall summer long. 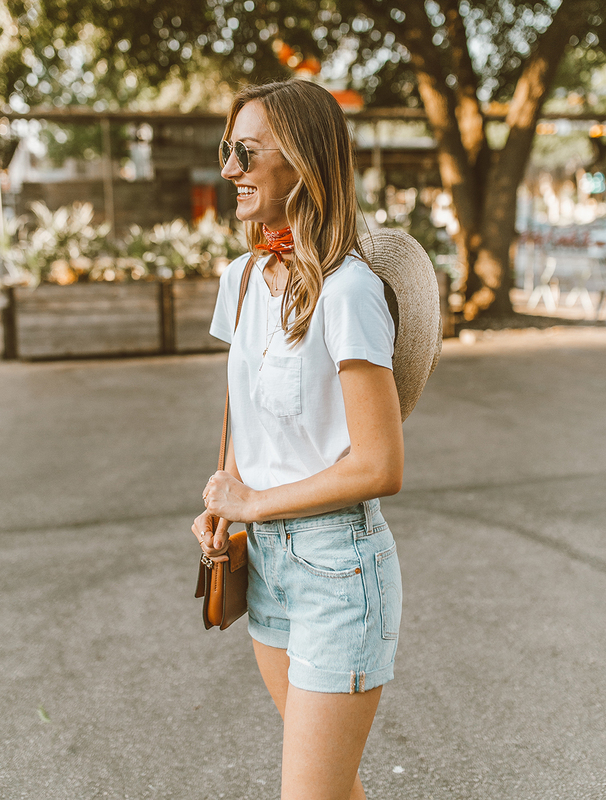 Levi’s denim shorts are such a classic go-to and always SO cute. 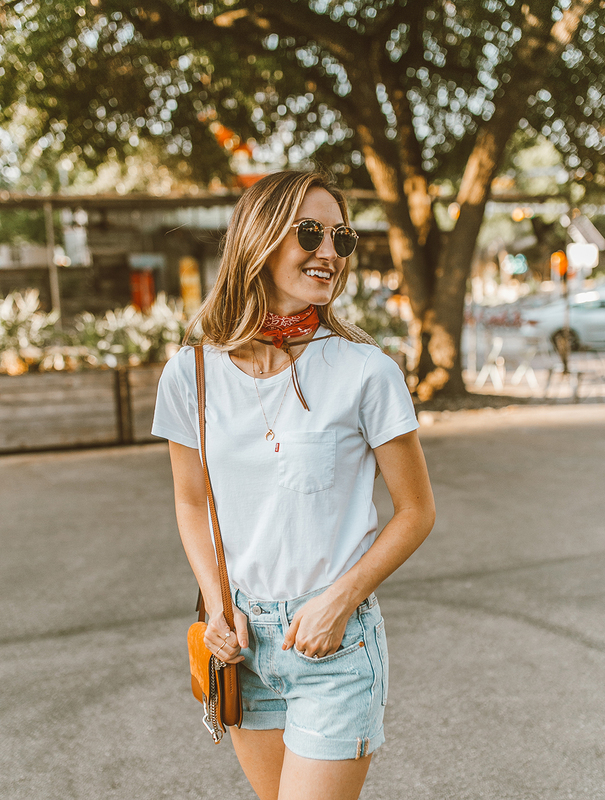 Pair with a simple white tee, layered necklaces and a bandana double wrapped and you’re ready to hit the festival grounds! 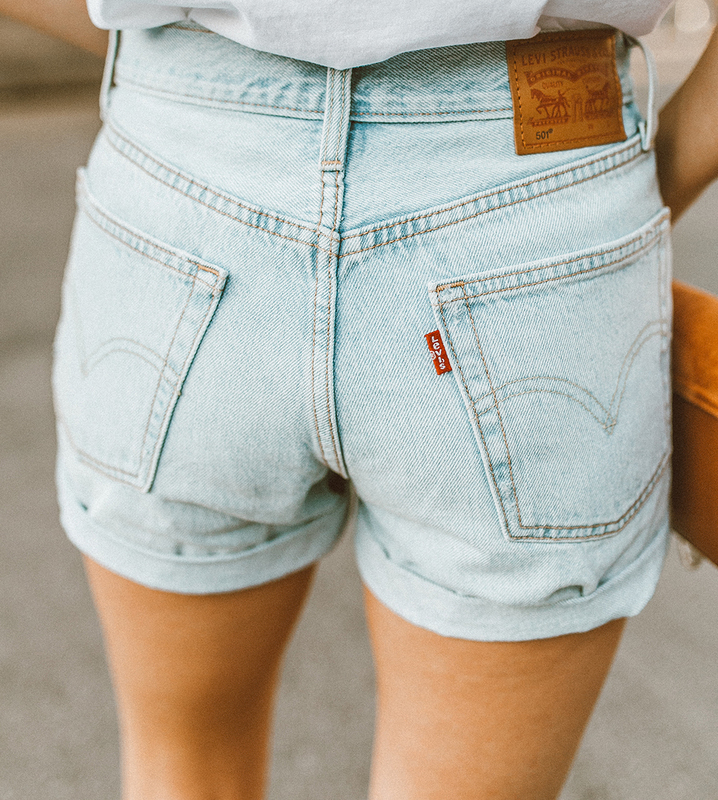 I don’t know about y’all, but it’s reaaaally hard for me to resist a good pair of Levi’s. If you’ve followed me for a while, you know my Levi denim collection is overflowing (#neverenough) aaand that I keep coming back for more. 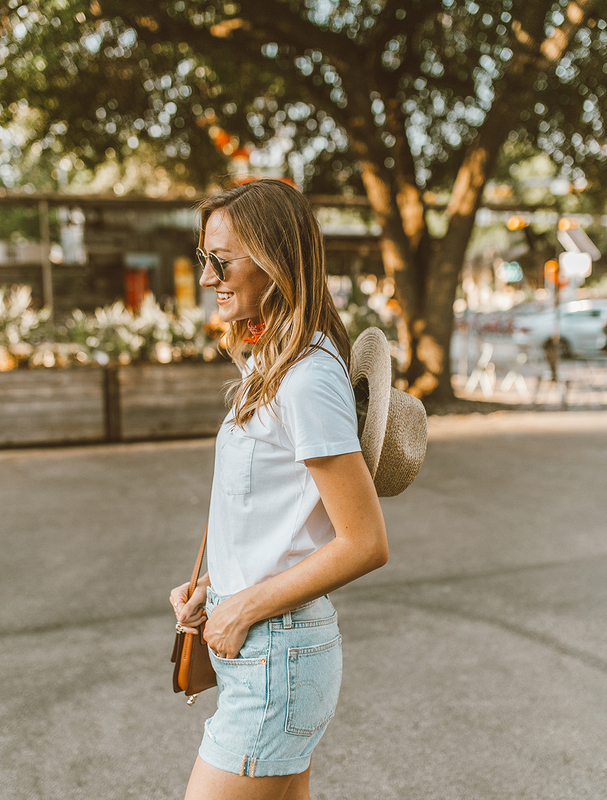 Whether you’re into the super tight high rise, or the mid-rise relaxed fit (like the ones I have on! ), I promise Levi’s carries a style and wash made for you. Their selection of shorts, jeans, overalls (!! ), tees and accessories is killing it lately and I especially love that it’s all SO wearable. 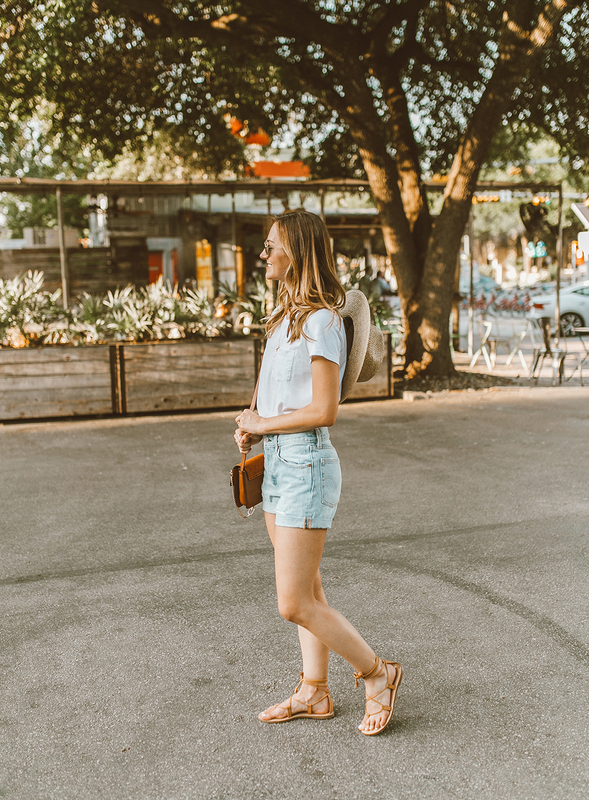 I’m talkin’ wear-to-grab-coffee, wear-to-take-Watson-on-a-walk, wear-on-a-date (…this outfit is actually very socially acceptable at all times in Austin haha), and of course, wear-to-break-it-down-at-the-festival. Yes, yes and more yes. Ps. I am wearing a size up in the Levi’s 501 shorts! I normally get szie 25 in bottoms, but preferred the more relaxed fit of the 26 in these. Seriously LOVE these and have been living in them!! A big thank you to Levi’s for sponsoring this post! All opinions are my own. 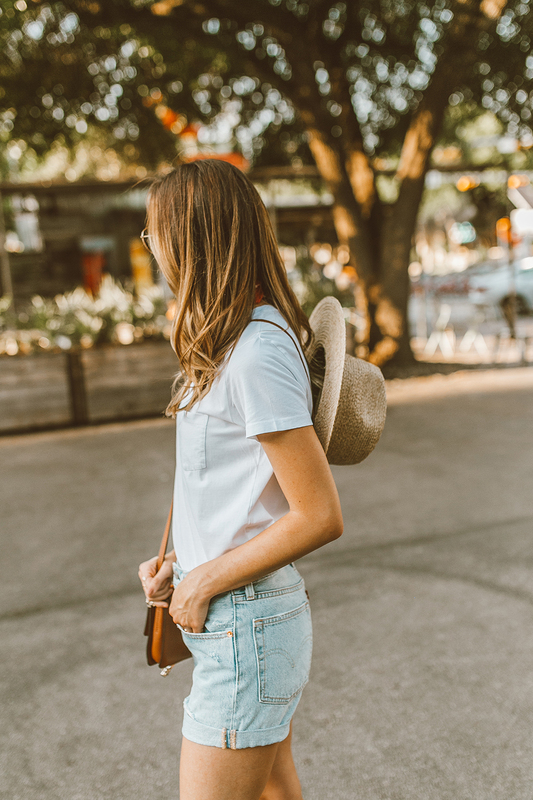 Love your bloggin’ style! And your patio reno was TO DIE FOR! Lived in Austin for 4 years now and FINALLY going to ACL for the first time this year!! Couldn’t pass up Paul McCartney and Childish Gambino! SO excited! That’s a great look to celebrate Summer! The rounded sunglasses complete this outfit. 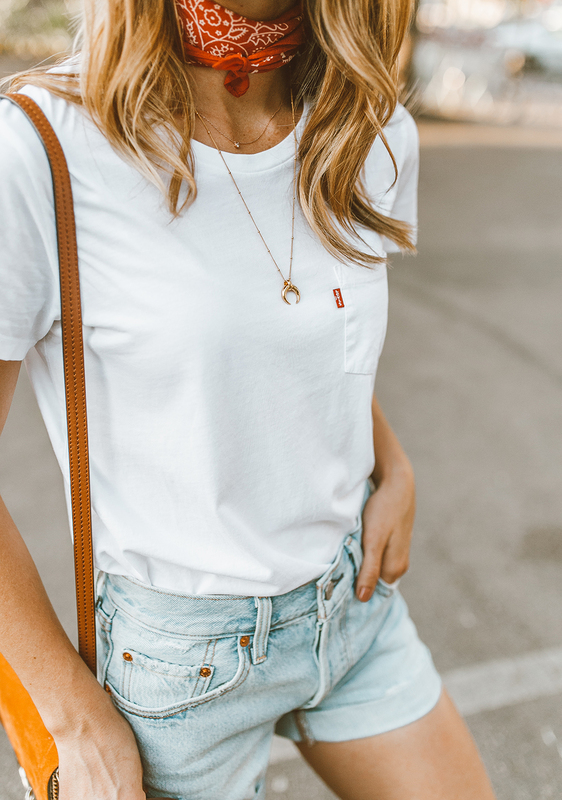 White tee and denim shorts is a simple combination, but it does work! Like the lace-up flat sandals! I totally agree, I love Levi’s!!! I have two pairs of jeans and two pairs of jean shorts. I just bought a pair of 501 shorts from Nordstrom this season and have been living in them and my other pair is a couple years old, a vintage, destroyed pair from Urban Outfitters. If you had to make me pick a favorite I couldn’t, haha. Hey!! I absolutely love this outfit but what color are you nails??? Love the Levi’s but question about the hat! Is that a Tula hat from Austin? If not where can I get one like yours?! Those shorts are sooo cute! I have been having the hardest time finding a pair that actually looks nice on me because my legs and waist are so dang tiny! I am def going to invest in a pair because it gets hot here and I want to be as comfortable as possible! Gorgeous looks! You are looking stunning. 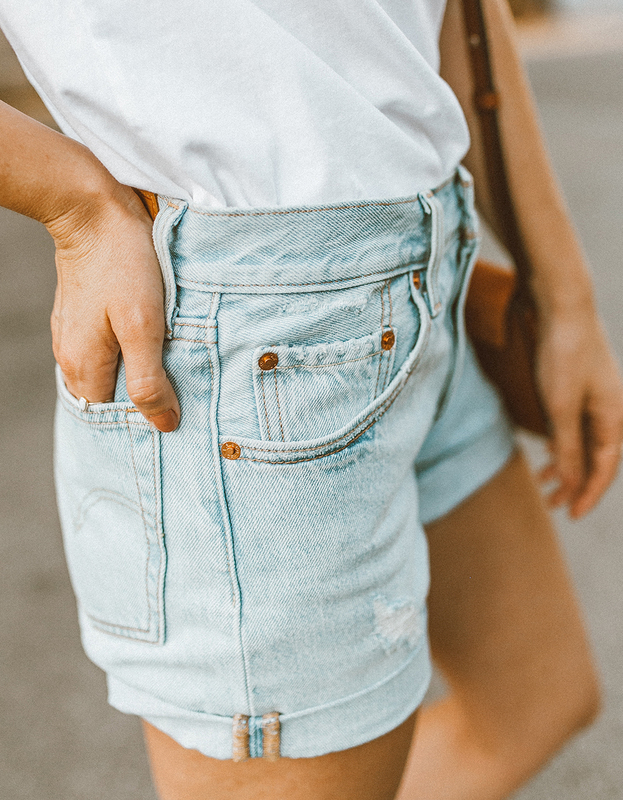 These are the best ways to rock with denim shorts. I am so excited to try these styles. Thanks for sharing.